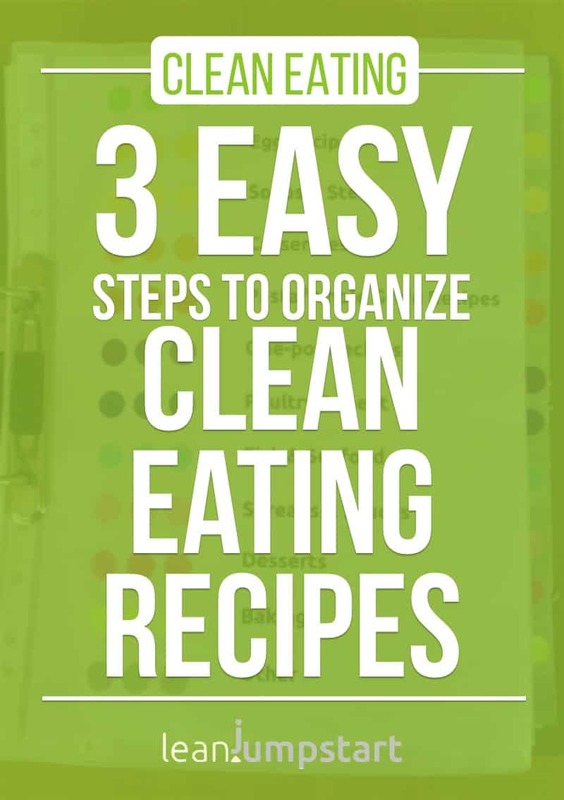 This week we’ll look at how to organize recipes for the fiber-rich clean eating cuisine in 3 easy steps. The goal is that you choose a method that works best for you to simplify your preparation and cooking process. 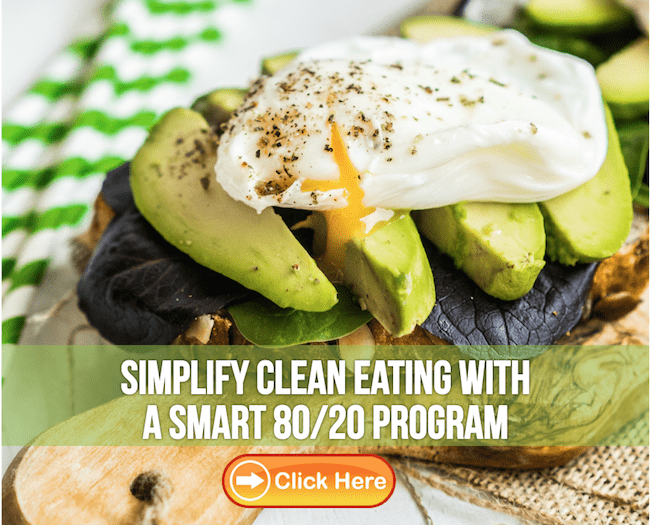 With an 80/20 clean eating approach, you aim to eat clean 80% of the time. That’s why your favorite high-fiber meals and ideas need a place that is easily accessible. My advice is to store them separate from your other less clean treats. For a long time, a recipe box with index cards was a great way to keep you organized. I still remember my grandmother’s index cards sprinkled with powdered sugar. • Such a box doesn’t need much space and once it is full you can just stick another box on top of it. • You can arrange all data in categories very easily and quickly. • You’ll have to transcribe everything or cut it out in a way matching your index cards. With larger pages of magazines, this gets difficult – especially if printed over a double page. • If you don’t like your own handwriting, you won’t choose this method. • The index cards can get dirty when you’re cooking. All you need for this method is an empty notebook. There are some books made especially for clean eating. You then write or stick your clean eating recipes into them. • Such a book is handy, doesn’t need much space and you can take it with you everywhere. • It is difficult to arrange everything in categories. Once a category is full, you can’t include new pages. • You could use one notebook for each category or related category. But then again you need more space and it might get confusing over time unless you label them clearly. • If you don’t like an inspiration anymore, you’ll have to pull out pages, scratch them out or paste over them. Use an ordinary 3-ring binder. If it looks too plain, you can opt for binders sporting a hip design or decorate it yourself. In addition, you’ll need tab dividers and plastic page protectors. • You can categorize your clean eating recipes to your heart’s content (like the recipe box method). • If you store your sheets in plastic page protectors, you can wipe away cooking stains or similar. • Even double magazine pages can be stored. • It is quite easy to file new ideas in the system. A binder or organizer probably takes more space than a box or notebook. With technology creeping into all realms of our lives, you would think that paperless recipe organization is on the rise too. To a certain extent, it is! I could write a book on all electronic methods offered nowadays to manage your cooking and baking treasures. Many famous food blogs offer virtual recipe boxes or useful recipe apps. I know that some of my readers use “Evernote” to successfully organize their recipes. Pinterest is a great option too. And yet, according to a recent survey on “Lifehacker,” the majority (over 36%) still voted for the paper when asked for their best recipe manager. There probably is a certain intimacy that comes with browsing ideas on paper. At least that is how I feel about it in spite of being a girl who works on the web. As always, the first and the hardest step is decluttering. I’m sure that you have collected clean eating recipes from magazines or the web that you always wanted to try but you never did. Toss them away! You will see, this act is liberating! And then there are those cookbooks where you only love a few ideas from it. Scan or copy your favorite ones, then you can sell or donate it. Or give your dispensable cookbook to food-loving friends or relatives. And finally, all the crap you didn’t like after trying should, of course, be tossed too! The big advantage of decluttering is that you make room for your most important inspirations; you spot them quicker and save time in your cooking process. Once you have decluttered and categorized your recipes, decide on an organization method. An important criterion is that you think about what works best for you, how much space you have, how important the look and feel of your system is, etc. My approach is pretty basic. For the last couple of years, I’ve started to combine the binder method with my iPhone. 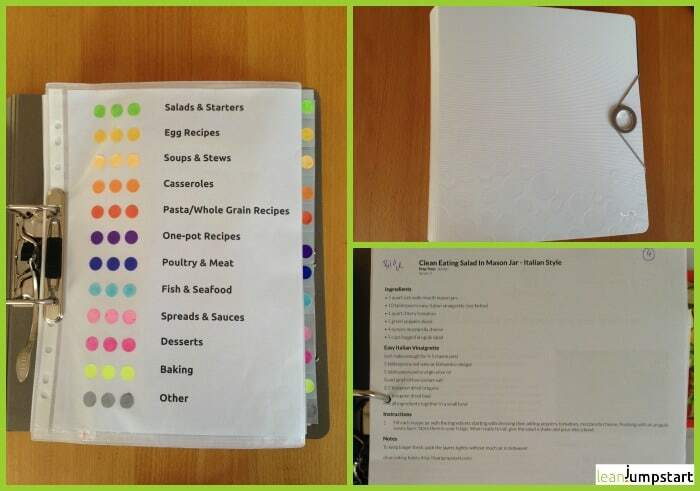 I use a regular German 2-ring binder (see below), those clear sheet protectors and divided sheets (for recipe cards). For my own clean creations I share on my website, I print the recipes out and store them in my special binder designated for them. When I stumble across a great recipe on the web, I first pin it on my Pinterest board. I can then easily access it via iPhone in my kitchen and give it a try. Only when I really love the result, I print it out and store it in my binder too. This method allows me also to transfer the recipe from a magazine, book, etc. without having to re-write it. What is your type of organization? I’m curious – how do you organize your clean eating recipes and why? Let us know in the comment section below! thank you so much for this very helpful idea. I love it! Including a section in the binder that is dedicated to single ingredients often used is a brilliant idea. Inspired by you I will use A-Z index tabs and fill them with the most used ingredients in my kitchen like e.g. pumpkin ingredient recipes (under “P”), quinoa ingredient recipes (under “Q”) or zucchini ingredient recipes (under “Z”). I see there is still a big project waiting for you after you are moved and settled. But I’m sure you will feel relieved after this decluttering process. It’s me again. I do one thing you have not mentioned. Although I may end up with duplicate recipes printouts or cards for some recipes, this idea keeps me from looking needlessly for a recipe. I have some ingredient files, so let’s say rhubarb which I get in the spring from my garden in bulk. By going to my rhubarb recipe file I have my rhubarb syrup, rhubarb cookies, rhubarb crumble, strawberry rhubarb pie (my favorite) etc so when I have 12 cups of cut rhubarb I can easily mix and match recipes to efficiently use the amount of main ingredient and not have to look through the cookie, pie, cake etc files to find the rhubarb ingredient recipes. My other always-being-used ingredient files are pumpkin, zucchini, black beans, cranberries, tomatoes and quinoa which quickly come to mind. How I have missed my organized recipes packed away during this house building! My pinned recipes help, but my notations and substitution notes on paper are invaluable. Your idea of sorting through and throwing out the bad for you recipes is one I will do for myself in the next year once we are moved and settled in as I have decades and boxes full to sort through as I have books and recipes from my mother, grandmother and mother-in-law when we had to clear out their homes. One treat I am going to do is to pick out a favorite recipe handwritten by various relatives and friends to frame and hang in my pantry. My maternal grandparents came from Sweden so I even have some written in Swedish!